Indigenous Peoples and communities hold legal rights to at least 15 percent of the world’s forests—some 500 million hectares—and use many more millions of hectares of forestlands under customary arrangements. These “community forests” serve as a primary source of livelihood, nutrition, medicine and employment for people in much of rural Africa, Asia and Latin America. New research shows they also generate billions of dollars in benefits for rural people and society. 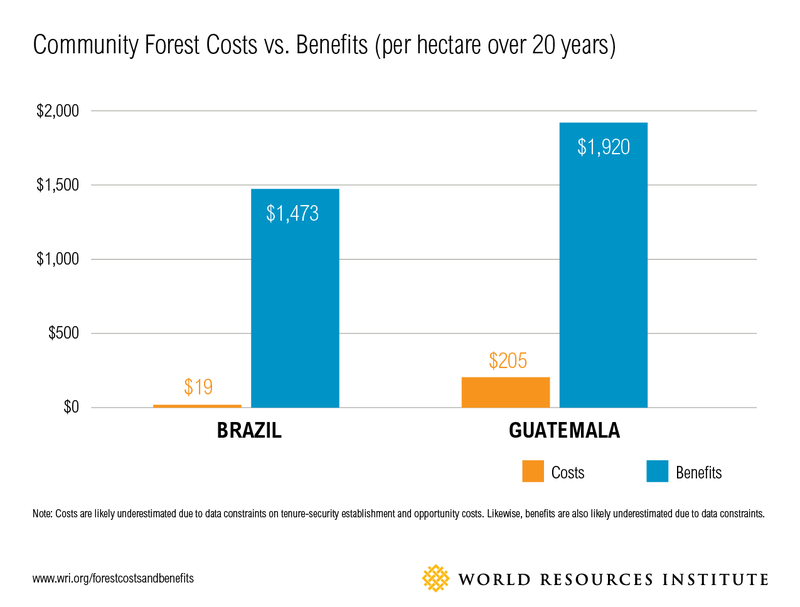 The proof is in two study areas featured in our new working paper, The Economic Costs and Benefits of Securing Community Forest Tenure: Evidence from Brazil and Guatemala. Results for Brazil’s Indigenous Territories and the community concessions in Guatemala’s Maya Biosphere Reserve (MBR) suggest that securing community forest tenure is a low-cost, high-yield investment that benefits communities, countries and the world. Our analyses show that in Brazil, the average annual costs of providing communities with secure rights to their forest is $1.57 per hectare (ha). Meanwhile the resulting carbon-mitigation benefits—the sequestration of carbon and removal of climate change-fueling CO2 emissions—range from $38/ha to $230/ha per year. That’s a net value of $1,454 to $1,743 per hectare for a period of 20 years. The bottom line? Community forests in the Brazilian Amazon bring $162 billion to $194 billion in benefits over a 20-year period. It’s a similar story in Guatemala. The annual costs for securing community forest tenure average $16.85/ha, while the carbon-mitigation benefits range from $120/ha to $187/ha, and the benefits from timber are $0.91/ha to $12.51/ha. The 20-year net value ranges from $1,715 to $2,280/ha for a total value of $605 million to $805 million dollars for the nine community concessions in the MBR. And these are likely conservative estimates. While costs are likely underestimated due to data constraints on tenure-security establishment and opportunity costs, full estimation of the many benefits community forests provide—such as ecosystem services, conflict resolution and more—would likely show an even more positive story. Results also indicate that investing in community forests is in many cases is a low-cost climate mitigation strategy, as research shows that deforestation rates inside community forests are significantly lower than in other forested areas. In Brazil, the cost of carbon mitigation through a 20-year investment in forest tenure security is between $0.39 and $0.52 per tonne of CO2 emissions (tCO2) removed from the atmosphere. And in Guatemala, the carbon-mitigation cost per tonne of removed CO2 emissions is estimated to be $7.37 to $8.50. Securing the forest rights of Indigenous Peoples in the Brazilian Amazon and community concessions in the Guatemalan Maya Biosphere Reserve could result in more than 5.4 billion tons of CO2 stored over 20 years—the equivalent of the annual greenhouse gas emissions from more than one billion cars. This is an especially important finding given the current state of international climate action. Many countries—both developed and developing—recently submitted their post-2020 national climate plans as part of the UN Framework Convention on Climate Change. Investing in community forests can be a low-cost, high-reward method for countries to meet their emissions-reduction commitments. Of course, community forests can only provide social and environmental benefits if they are protected in law and practice. Many of the world’s community forests are experiencing increasing threats—such as from logging and mining operations—that often undermine communities’ livelihoods and sustainable management practices. A recent report by the Rights and Resources Initiative found a decreasing trend towards recognition of Indigenous Peoples’ and local communities’ land rights in developing countries since 2008, and fewer and weaker pro-community reforms. Economic valuation can act as a tool for promoting more informed decision-making in countries with community forest populations. Extending the benefit-cost analysis approach from this working paper to other community forests around the world could advance policymakers’ understanding of the economic case for secure community forest tenure. WRI is currently collaborating with local experts to extend this work to other countries in the Amazon basin, such as Bolivia and Colombia. Tune in for our results in 2016. LEARN MORE: Download the full publication.